The initial reaction to the changes among potential Disney guests, however, has largely been confusion — and annoyance. Yet even with all these resources, it’s hard to gauge how much more (or less) you’ll actually pay for a ticket in the future. And the confusion is only partially because Disney did not release precise ticket pricing information. For the first time, Disney World is introducing date-based seasonal pricing for multi-day tickets tied to the exact dates of your trip. Expect to see peak season dates cost more and off-season dates cost a bit less. Some dates may cost the same as today. Until now, only one-day Disney World tickets had seasonal pricing — multi-day tickets were a consistent price throughout the year. Got that? We’ll try to explain more. Disney first introduced variable pricing on single-day tickets in 2016. At that time, a one-day ticket at the Magic Kingdom in Orlando cost $125 during “peak” periods. Those dates included the winter holidays, weekends year-round, and the summertime break from school. One-day tickets dipped to $105 during “value” periods, which were mostly limited to Mondays to Thursdays in low-demand months when kids are back in school. Single-day prices were slightly lower for Disney’s other theme parks, but they too featured higher prices during “peak” times and lower prices during “value” times. The variable pricing only applied to single-day tickets; multi-day passes cost the same no matter what time of year you used them. 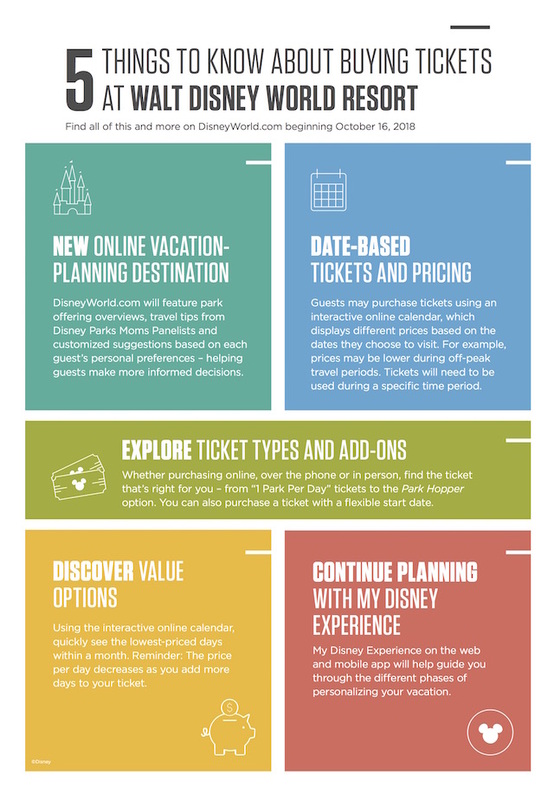 As of October 16, though, many of those ticket policies and pricing rules introduced by Disney two years ago will disappear. Going forward, variable pricing will still apply to single-day tickets. But in a few weeks, all of Walt Disney World’s parks will have uniform single-day ticket pricing. So you’ll pay the same to visit the Magic Kingdom (now up to $129) as you will to visit EPCOT or Hollywood Studios. Right now, a one-day adult admission generally costs $5 less at one of the latter parks compared to the Magic Kingdom. In other words, there will soon be price increases on single-day tickets to the non-Magic Kingdom parks. But the video states that “prices shown do not reflect actual pricing.” So it’s unclear how much multi-day tickets will end up costing. Disney says that it is instituting the new ticket price changes as a crowd-control measure. “Introducing date-based tickets and pricing will allow us to better distribute attendance throughout the year so that we can continue to improve and deliver a great experience,” the company’s blog post stated. Naturally, Disney guests are all in favor of smaller crowds and shorter lines. But year after year of price increases has made it exorbitantly expensive to bring a family to Disney World. Many people also seem increasingly put off by how complicated it is to find out how much the tickets cost, and how Disney is killing spontaneous fun by forcing guests to lock in the first day of their visit as well as advanced reservations for meals and ride times. “For a company with an amazing reputation in hospitality, they’ve really gone out of their way to make a visit to one of their parks infinitely more complicated than it needs to be,” one commenter at Theme Park Insider said. “I’ve been pretty OK with most of how the Mouse manages ticket sales, but this just annoys the crap out of me. Buying tickets should not be so complicated,” another said. Others responded to the news with questions: “How is this going to work if you are there for 7 days but only do the park for 5 days? What happens if you need to postpone your trip?” one commenter wondered at another Disney fan site, WDWInfo.com. Others chimed in on social media to say Disney’s new pricing structure is just a bad idea. This is just craziness! Who came up with this idiotic idea? They truly are pricing a lot of families out of Disney more and more each day. Very sad.